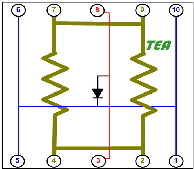 To accommodate a wide variety of applications, TEA uses the Unit Cell concept which is the basic building block for the TTCs. Each Unit Cell is completely contained with both one or more heating resistors and one or more diode temperature sensors. By using multiple Unit Cells in a square or rectangular array configuration, it is possible to approximate almost any size application chip or meet specific size requirements. 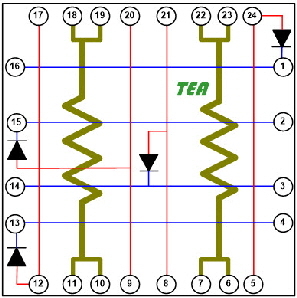 TEA currently offers two different TTC Unit Cell sizes in both wafer and chip formats. For further information on TTC-1002 (2.5mm X 2.5mm) Unit Cell , please click here. For further information on TTC-1001 (1mm X 1mm) Unit Cell , please click here. TTC-1002 & TTC-1001 Chips are now available for purchase on-line. Please click here to see list of chip sizes and other attributes. Also available are custom single and multiple chip packaging capabilities. If you would like more information or on thermal test chips or if you have special requirements, please contact us by e-mail using the address shown above. You can also use the TEA message response form.